The moving date is fast approaching, though we are not sure of the exact date. It was September, then October, then November, and we are now back at October. October 1st or 31st? I have little to no control over that, so I have decided to focus on what I do have control over: packing, or more specifically thinking about packing. We are starting to panic! On one hand, it would be nice to get rid of everything and start anew in India. On the other hand, we are materialistic Americans and we like “stuff”. Our stuff! We are also going for a limited amount of time, it’s not a permanent move. Our apartment will be fully furnished, all the way down to the pots and pans and bed sheets. As much as it is possible to start fresh and buy everything once we settle in Bangalore, it would be financially devastating to have to do the same when we come back. We have not yet decided what to bring with us. The amount of luggage space available will dictate much of it. We are lucky, we are taking a shipping crate (about 2 m3) and whatever luggage the airline will allow. Since the kitties will be our carry-ons, we are facing a problem of how to bring the expensive items such as computers and cameras. Should we trust the company shipping the crate, or the airlines handling our suitcases? 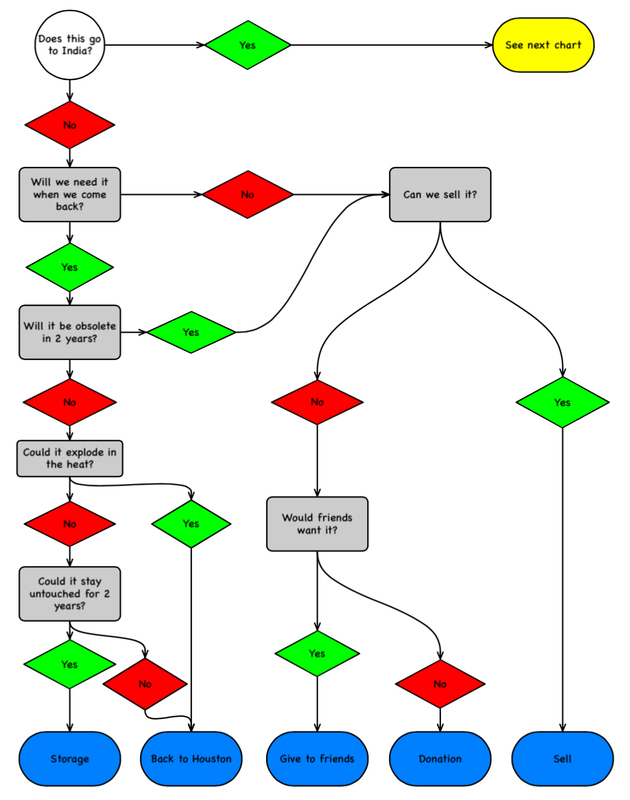 So I made flow charts in the hopes that visualizing the process would help. You can take the girl out of academia, but you can’t take academia out of the girl! For all the articles that will not be shipped to India, we need to decide what to do. We can sell them, give them, store them or bring them back to Texas. If we don’t bring it with us, what do we do with it? And for everything that we take, we need to think of the best method for shipping to destination. How will it arrive in India? This doesn’t solve the problem of what will be moved to Bangalore, but it’s a step in the right direction: East! The app I used for the charts is PureFlow, and it’s free. This entry was posted in Preparing for the trip and tagged app, Bangalore, chart, crate, expat, flowchart, India, luggage, migration, moving, PureFlow, storage, suitcase. Bookmark the permalink. What will you be doing with your home while you’re away? Rent it? We are selling, it’s much simpler that way. We moved back last year, its such a task… Im glad im over with all the uncertainty and now Im able to foresee the near future. Good luck with the move! It’s been over 20 years since my last move around the world, I am out of practice! You have such great charts! Mine goes like: stuff everything in suitcase in order of importance. Whatever doesn’t fit, leave it or give it away. Usually this ends in buying more stuff later. 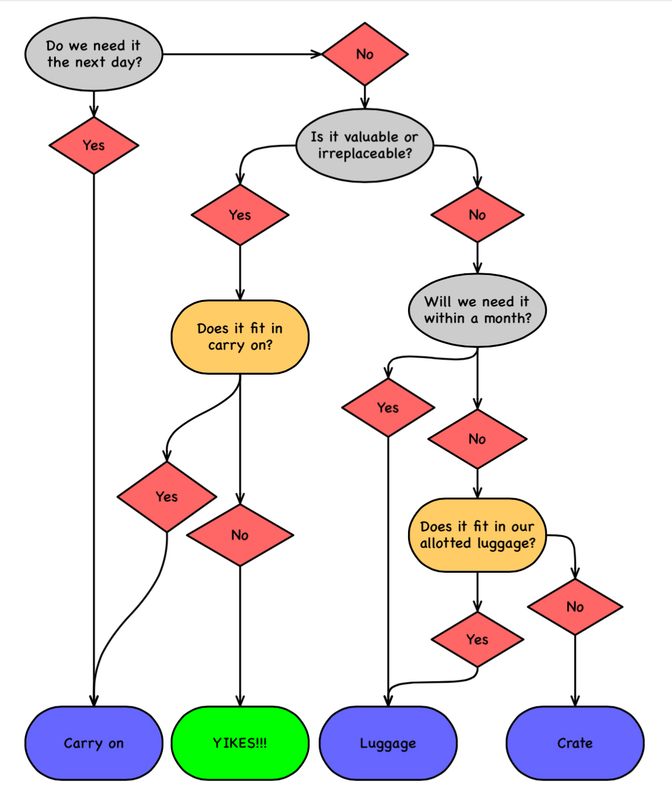 Maybe I need to try this flow chart magic. The charts are the theory. We’ll see how it works in a couple of months!